Omroy Kerr put on three point shooting clinic as the in-form Montego Bay Cricket Club Knights soared to the top of the Western Basketball Association Elite League standings with a devastating 83-62 trouncing of former champions Catherine Hall All Stars in Sunday’s match played at the Montego Bay Sports Complex. Kerr, who had a hot hand early on from behind the arc, exploded for five threes, three in succession, and also effected three steals just under the basket in accumulating a game-high 27 points for the efficient-looking Knights. Playing at a high tempo and with a complement of just six players, Knights cantered to the big 21-point margin of victory to move to the top of the standings with 27 points, just one ahead of the defending champions Granville Jaguars. Antonio Spence, who missed a host of lay-ups, ended with 22 points and 13 rebounds, while Omar Campbell, 10 points, and Jhuan Bryan, 12 and 18 boards, also had good scores for the Knights. Rayon Gardiner contributed 12 and 10, along with 9 steals, a near triple double. They also ticked off a 13th victory of the season, while effecting a third on a jaded-looking All Stars team, slow from the blocks and unable to garner any momentum throughout the contest which ended in darkness. 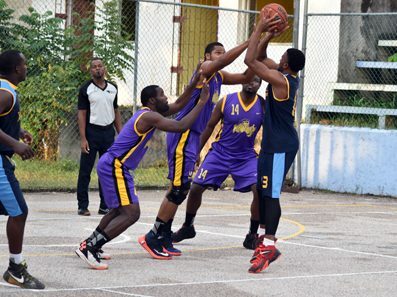 For the All Stars, who had to endure some very physical contact low down in the paint, Odane Whittaker and Mikhail Smith were two of three in double figures with 17 and 16 points respectively, as they plummeted to the heavy beating. Smith also collected 10 rebounds. Knights were in ruthless form from the opening whistle and cantered to a 30-6 lead, all but wrapping up the match. All Stars came back in the second quarter with an impressive shooting, but it proved too late as the Knights had already tied the winning bow, going on to outscore their opponents 36-33 in the second half. Meantime, Holland Saints returned to winning ways with a narrow and losing scoring, 49-47, victory over Sav Elite Titans in Saturday’s match-up. Aldane Anderson bagged 19 points for the winners, while hauling down 8 rebounds and Kenrick Lindo supplied a double-double, 10 points and 15 boards. David Jarrett with 14 rebounds and 7 points also gave support. For the Titans who won back-to-back games last week, Troy Reid scored a team-high 16 points, while Rushane Drummond added 13 points and bagged 20 rebounds.